Diesel vehicles typically have good fuel economy, but hot on the heels of the Volkswagen affair, Australia is set to tighten the rules for diesel car emissions - which will put a dent in engine performance. Diesel cars have been rather controversial lately, as anyone who has been following Volkswagen’s recent tribulations will know. In the past few years diesels have surged in popularity in Australia. They now account for 19.7 per cent of all registered vehicles (up from 13.8 per cent in 2010). The number of registered diesels increased by more than 60 per cent from 2007 to 2012. Consumers have embraced diesels mainly because of the savings delivered by their favourable fuel economy. But the Volkswagen scandal suggests that some manufacturers can design engines that meet either the requisite emissions standards or the market’s expectations of fuel economy and driveability, but might struggle to achieve both. Australian emissions standards have generally lagged behind those of Europe and the United States, but the gap will reduce in November 2016, when Australia will adopt the full Euro 5 standard for all light vehicles. Motorists will see the advent of hitherto unfamiliar emissions control devices, and it could potentially signal the end of the road for booming diesel sales. Diesel exhaust contains many compounds, although the regulations are mainly concerned with just three: carbon dioxide (CO₂), nitrogen oxides (NOx), and particulate matter. CO₂ is a greenhouse gas and one of the principal combustion products of the fuel itself (the other being water). Virtually all of the carbon in the fuel is converted to CO₂, so a reduction in these emissions must necessarily come from an improvement in fuel economy. NOx is formed in diesel engines under the twin conditions of high temperature and high oxygen concentrations. Particulate matter, meanwhile, consists mainly of carbon nanoparticles from partially burnt fuel and is formed when temperature and oxygen concentrations are low. This means that any attempt to reduce NOx emissions by altering temperatures and/or air-fuel mixing would tend to increase particulate matter emissions, and vice versa. 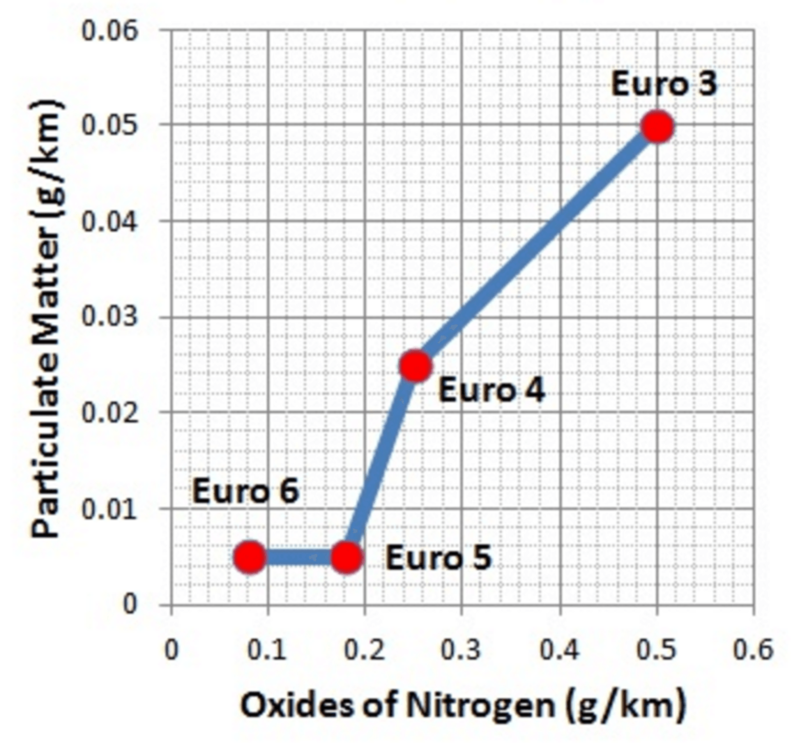 Australia’s impending move from the Euro 4 to Euro 5 standards will require a 28 per cent reduction in NOx emissions and an 80 per cent cut in particulate matter emissions, as this graph shows. There are several methods to achieve these cuts, each with its own technical problems. Exhaust gas recirculation (EGR) returns a portion of the exhaust gas to the engine’s air intake, thus reducing the amount of air (hence oxygen) entering the cylinders. This also reduces cylinder temperatures, all of which helps cut NOx emissions. The downsides of EGR are a reduction in fuel economy (and therefore an increase in CO₂ emissions), as well as reduced power and an increase in particulate matter. The system is also prone to fouling by particulate matter and can increase maintenance costs. Diesel particulate filters (DPFs) are widely recognised as the most practical way to meet the 80 per cent reduction in particulate matter emissions required by the Euro 5 standard, but these are also problematic for car owners. To avoid the DPF becoming clogged, removal of the particulate matter collected by the filter is done periodically by oxidation. This typically requires at least 10 minutes’ continuous fast driving, such as on a highway, roughly once every 300-800 km. So if the car is predominantly driven on short urban trips between home, work and the shops, the DPF could prematurely stop working. Even for diligent owners who follow this procedure, DPFs are not without their problems. By acting as an obstacle to the free flow of exhaust gases, they reduce engine efficiency and fuel economy, resulting in higher CO₂ emissions. And while the carbon in the collected particulate matter can be oxidised, metallic ash from lubricating oils and engine wear remains in the filter, which necessitates periodic cleaning. Buyers of used cars in particular should factor in the cost of replacing a DPF, which can be several thousand dollars. Where does this leave diesel cars versus petrol ones? Diesel engines have historically offered fuel economy savings of 5-20 per cent relative to petrol (see here and here), and these savings increase with the size and weight of the vehicle. Against these savings must be weighed the generally higher price of diesel fuel over petrol in Australia, greater vehicle purchase and maintenance costs, and now the fuel economy penalty caused by new emissions control systems. EGR and DPFs can reduce fuel economy by up to 6 per cent and 3 per cent, respectively. The need to regenerate DPFs through periodic long-distance driving might be a burden for some drivers not used to driving these distances. As increasingly stringent emissions standards begin to weaken the financial rationale for owning a diesel, we may start to see diesel car sales drop – particularly for small and mid-sized passenger cars, where the fuel economy advantages were weakest to begin with. Varun Rao, is research engineer, Maintenance Technology Institute, Department of Mechanical and Aerospace Engineering, Monash University and Damon Honnery is professor, Department of Mechanical Engineering, Monash University This article was originally published on The Conversation.